Back Row Left to Right: Scott Shepherd '82, David Palmer '62, Daniel Werner '91, James Randall '66, and David Gillcrist '81. 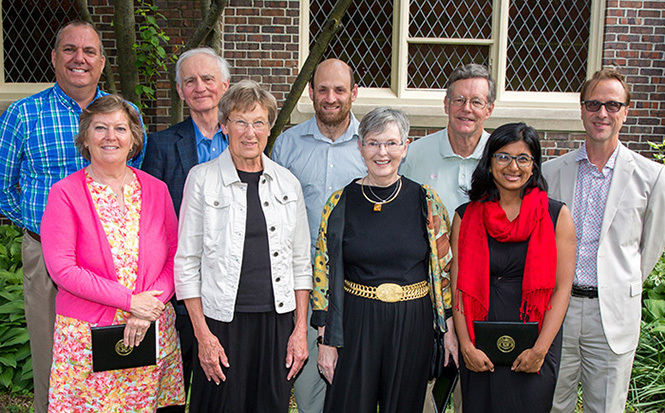 Front Row Left to Right: Laura Cleveland Shepherd '82, Caroline Tollefson Owens '62, Susan Scholl Folstein '66, and Luna Ranjit '00. When Caroline Tollefson Owens learned about the work that Grinnell Prize winner James Kofi Annan does to support survivors of slavery and child labor, she applauded it. And then she helped move the work forward. In 2014, in her mid-70s, Owens traveled to Winneba, Ghana, to catalog more than 8,000 books in a newly-built library for 700 students. The trip was just one of many ways that Owens has made pioneering choices throughout her life. 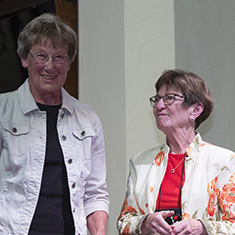 After graduating from Grinnell with a degree in sociology and anthropology in 1962, she took a classic path for women of the time, marrying fellow Grinnellian Joe Owens, Class of 1961, raising a family, and doing significant volunteer work. In 1979, she returned to school, earning a degree as a Certified Public Accountant from George Mason University. She found herself in high demand, and ultimately became a corporate controller and vice president of finance for two corporations. She also used her new financial skills to put local chapters of the Girl Scouts and Habitat for Humanity on firmer financial footing. In recent years, she has taken up increasingly ambitious athletic pursuits. She picked up basketball in her mid-50s and competed in triathlons during her 60s. In her 70s, she has completed multiple 500-mile bike rides for Minnesota’s Habitat for Humanity and competes in the Minnesota Masters swim program. For always finding ways to choose a bigger life, we are pleased to recognize Caroline Tollefson Owens, Class of 1962. When Dave Palmer took a position as a history instructor at Iowa Lakes Community College in 1968, he hadn’t just landed a job. He had discovered a lifelong mission that would make him a powerful advocate for Iowa’s community colleges. 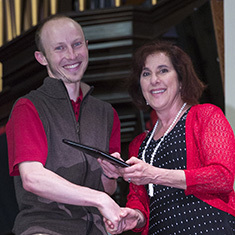 A top student at Grinnell, Palmer graduated Phi Beta Kappa with a degree in history. He earned a master’s degree from the University of Iowa. Palmer spent more than 20 years as a history instructor at Iowa community colleges, and went on to take increasingly responsible administrative roles, ultimately becoming senior vice president of governmental affairs for Des Moines Area Community College. Throughout his career, he been an active supporter of affordable higher education for Iowa citizens. He is an advocate for all of Iowa’s community colleges, and believes strongly in an educational system that provides opportunities to students with a wide range of abilities. His home life has been perhaps even more remarkable. He and his wife, Pat, have two biological children and seven adopted children, many of whom came from challenging circumstances in Korea or Vietnam. His commitment to all of his children has been steadfast, and two—Julianne, Class of 2000, and Edward, Class of 2001—have graduated from Grinnell. For his dedication to giving so many people opportunities to live better lives, we are proud to recognize David L. Palmer, Class of 1962. In the effort to understand the causes of autism, few have been as influential as Susan Scholl Folstein. Folstein earned a chemistry degree from Grinnell and an M.D. from Cornell University Medical College. As a scientist, she showed early promise. In 1975, a paper she co-wrote with her husband, Marshal, offered a simple bedside test of cognition to screen for signs of dementia. It is now the single-most cited paper ever published in psychiatry. She found her calling in 1977, when she co-authored a study of twins, one or both of whom had autism. Her study helped scientists understand that genetics were the biggest and most important cause of the disorder. She and her husband spend 18 years at Johns Hopkins University, where she focused on the interface between psychiatry and genetics. She started the division of psychiatric genetics, and was the first woman to be promoted to professor of psychiatry. She also directed the division of child psychiatry until she and her husband joined Tufts University in 1993. There, she became director of research and child psychiatry at the New England Medical Center. She also started an international group of researchers studying autism genetics. After retiring in 2004, she continued to serve as an expert witness in legal cases linked to the inaccurate idea that vaccines cause autism. In 2009, she and her husband moved to Miami Beach, where she founded an autism clinic at the University of Miami. Her work has been frequently recognized. In 2012, she received a Lifetime Achievement Award from the International Society of Psychiatric Genetics and from the International Society for Autism Research. For her groundbreaking scientific work on autism, we are pleased to recognize Susan Scholl Folstein, Class of 1966. Jim Randall has long been an enthusiastic advocate of Grinnell. But it is his actions in the face of unimaginable tragedy that make his support for the College even more remarkable. Randall earned a degree in political science from Grinnell, and went on to earn an M.P.A. in urban affairs from American University. He spent much of his career working in local government, including management positions in Virginia, Massachusetts, and California. His love for Grinnell rubbed off on his son, also named Jim. His son graduated in 1994 and stayed at the college to coach the men’s and women’s swim teams. In 2003, he died in a car accident on a way to a swim meet. In the wake of this devastating accident, Randall and his wife, Janie, started a scholarship fund in their son’s name. The fund supports internships and projects for those with Spanish majors and concentrations. It is designed to broaden students’ horizons, which the Randalls felt Grinnell had done for their son. Randall also has been a driving force in his class’s reunion planning committees, taking on even mundane tasks with enthusiasm and joy. Classmates call him the “Energizer bunny” of the committee. For his selfless work that has benefited Grinnell in myriad ways, we are pleased to recognize James W. Randall, Class of 1966. The challenges of living in New York City are well documented, but for vulnerable seniors, the obstacles can seem nearly insurmountable. For more than 25 years, David Gillcrist has helped make the city a more humane and habitable place through his work with publicly assisted housing. After graduating from Grinnell with a degree in religious studies, Gillcrist went to Senegal as a Peace Corps volunteer. After finishing his assignment there, he moved to Mali, where he assisted famine relief work for World Vison. He returned to the United States to earn a degree in city and regional planning from Cornell University. 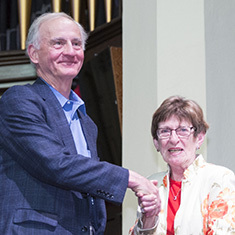 While there, Gillcrist decided to direct his energies domestically where he became deeply involved in the development of community-based affordable housing. His work has included supporting the development of low-income housing in East Harlem as development and communications director at Hope Community. He has also served as a seed funder for the development of supportive housing for formerly homeless adults with chronic mental health conditions during his 7 years at the Corporation for Supportive Housing. Since 2002, Gillcrist has worked at Project FIND, where he is currently executive director. The organization owns three buildings with more than 600 apartments for formerly homeless and low-income older adults, as well as four senior centers with 3,000 members. During the course of his tenure, Gillcrist has expanded many of the organization’s programs, including a special program to house street homeless elderly and added a hydroponic rooftop garden, which provides fresh produce for his center kitchens. 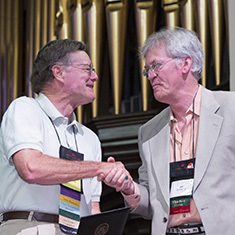 Colleagues praise his visionary work, deep empathy, and exceptional generosity. For his decades-long commitment to supporting New York’s vulnerable populations, we are pleased to recognize David W. Gillcrist, Class of 1981. For some alumni, the Grinnell experience imprints on them so strongly that it is as though it has been etched directly into their DNA. Such is the case for Laura Cleveland Shepherd and Scott Shepherd. They became a couple while volunteering at New Student Days in 1979, and they are both among the college’s fiercest champions. While at Grinnell, Scott earned a degree in religious studies and played on the baseball team. He helped create the quintessential Grinnell experience as a hall coordinator and as member of both the 100 Days Party and Grinnell Relays Committees. Laura, meanwhile, earned a degree in American Studies. She served as a student advisor, hall president, and a student government delegate. Like Scott, she also was a member of committees for the Grinnell Relays and 100 Days Party. Since graduation, they have both gone on to build successful careers and pursue meaningful volunteer work. Laura spent 30 years as an elementary school teacher in both Tulsa and Norman, Oklahoma, earning numerous teaching awards. She earned her school’s “teacher of the year” honors in 1998 and 2012. She has been an active volunteer at each of the schools she taught, as well as a volunteer for Teach for America and Meals on Wheels. Scott, meanwhile, climbed the career ladder in the natural gas industry, starting as a meter reader for Oklahoma Natural Gas. He is currently vice president of change management for ONE Gas. Outside of work, he volunteers for Habitat for Humanity and the United Way. But it is their volunteer work for Grinnell where they both shine most brightly. The Shepherds are also known for their generosity outside of the formal volunteer structures of Grinnell. They have been enthusiastic and generous contributors to the ECN care packages effort, including driving to Grinnell this February to help distribute packages. Their enthusiasm for the college has had a concrete impact in other ways, too: their daughter, Hannah Shepherd, is a 2012 graduate of Grinnell. 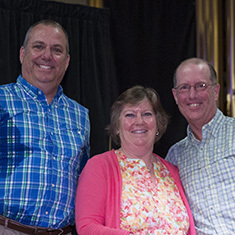 For their sincere and committed service to Grinnell, we are pleased to recognize Laura Cleveland Shepherd, Class of 1982, and Scott Shepherd, Class of 1982. From the moment Dan Werner enrolled at Grinnell, he was finding ways to fight for social justice. At Grinnell, he majored in Spanish and anthropology. As a student, he planned a boycott of pesticide-covered California grapes, which were dangerous both to the workers who harvested them and people who consumed them. He also co-founded the Persian Gulf Alert student organization because of his concern about the United States’ invasion of Iraq in 1990. He went on to earn a law degree from SUNY-Buffalo and to work for the Migrant Farmworker Justice Project in Florida for several years. He then served for seven years as an attorney for Farmworker Legal Services, where he fought for the rights of thousands of migrant laborers. In 2003, he cofounded the Workers’ Rights Law Center of New York to address the larger needs he saw for low-income and non-farm workers. In 2005, Werner received Grinnell’s prestigious Wall Service Award to support this work. Werner joined the Southern Poverty Law center in 2008. Recently, he spearheaded an effort against a ship builder for labor trafficking, fraud, and discrimination against Indian workers. The suit resulted in a unanimous jury victory and a $14 million civil award, the largest of its kind. For their work, he and his team were named Trial Lawyers of the Year by the Public Justice Foundation this past year. 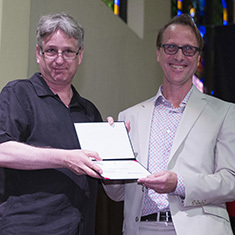 For his tireless pursuit of justice, Grinnell is proud to recognize Daniel A. Werner, Class of 1991. When Luna Ranjit launched a tiny nonprofit in 2005 with a single $500 donation from a Grinnell professor, she gave the fledgling venture an ambitious name: Adhikaar, a word that means “rights” in Nepali. In the decade that has followed, she and her organization have lived up to the name, making concrete progress to support Nepali-speaking and other immigrant communities in New York City. At Grinnell, Ranjit was a stellar student who majored in economics and global development studies. She went on to earn a master’s degree in international affairs from Princeton in 2004. In 2005, she founded Adhikaar as a response to growing calls about unpaid wages, employment discrimination, and domestic violence in New York City’s Nepali-speaking community. 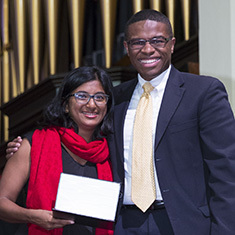 Ranjit’s organization gained steam with the aid of the Wall Alumni Service Award she received in 2006. Over time, the organization has become an increasingly powerful voice for vulnerable populations. In 2010, she and the organization played an instrumental role in the successful passage of New York State’s Domestic Worker Bill of Rights, the first legislation of its kind in the country. More recently, she and the organization have helped expose unsafe and unfair labor conditions in New York nail salons. After a widely-read expose in the New York Times, New York Governor Andrew Cuomo enacted emergency measures and legislative changes to protect these workers. 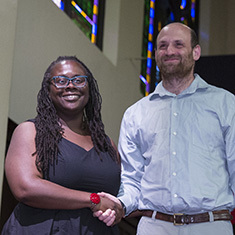 Luna was also recently named as one of the 2016 Grinnell Prize recipients. The Grinnell Prize began in 2011 and awards prizes of $100,000 annually to innovative individuals for their social justice work. She is the first Grinnell College graduate to receive the Prize and we look forward to recognizing her, again, in October. But for today, and for her successful efforts to improve the lives of the Nepali-speaking and other immigrant communities in New York City, we are pleased to recognize Luna Ranjit, Class of 2000. With the help of the tiny tamarin monkey, Mini Watsa has brought the joy of scientific research to hundreds of students around the globe. With her incisive and powerful journalistic stories, she has given millions of readers deep insight into the challenges of the biodiversity crisis. Watsa earned a biology degree at Grinnell and a master’s and Ph.D. in physical anthropology at Washington University at St. Louis. While at Wash. U., she began studying the elusive saddleback and emperor tamarins in the wild. Thanks to her patient work, she and her team now have the largest current study populations of these species in the world, which provide vast amounts of behavioral and physiological data. Her work with these primates led Watsa to start what has become one of the defining projects of her life: PrimatesPeru, which is now Field Project International. What started as a modest, summer research-based organization now has grown to offer multiple international field study opportunities to students of a variety of educational backgrounds. Watsa’s writing has scaled her reach even further. She contributes powerful stories to the environmental news service Mongabay. In 2014, the site awarded her its top prize for her writing. 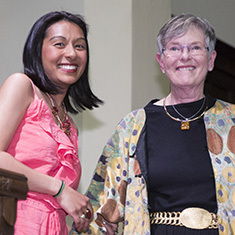 For her tireless commitment to do unique scientific work — and to instill in others the joy and importance of this pursuit — Grinnell is pleased to recognize Mrinalini Watsa, Class of 2006. Mrinalini’s husband, Gideon Erkenswick, Class of 2006, accepted this honor on her behalf as she has recently given birth to beautiful twins.